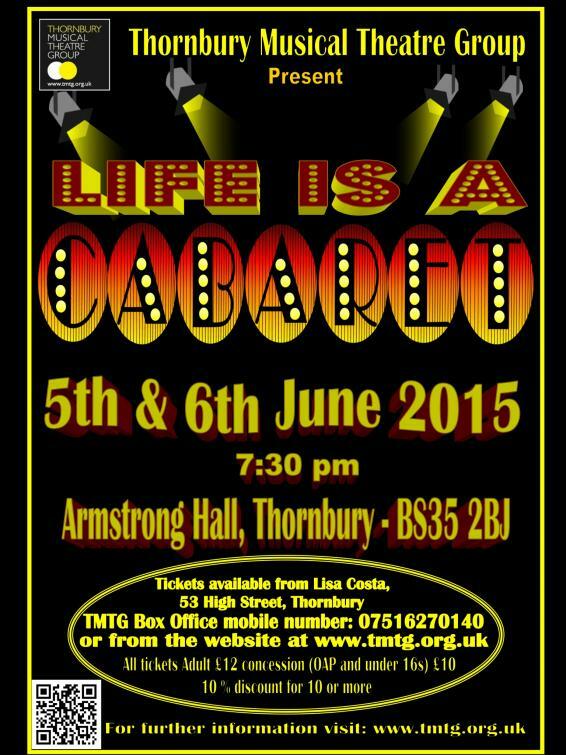 TMTG presents Life is a Cabaret, which will be performed in the Armstrong Hall, Thornbury on the 5th and 6th of June 2015, under the direction of Keith Glasspole. Members of TMTG performing in our next show "Life is a Cabaret" are hard at work rehearsing for the show which takes place on 5th and 6th June at The Armstrong Hall. Well known cabaret songs which span over 100 years will be included such as: Hernando's Hideaway, At Last, Baby it's cold outside and New York, New York amongst many more. So you will be able to sing along to the songs featured! Make sure you book your tickets soon by clicking "Get Tickets" on the menu above.